• Gas, Lpg, Oil & Electric. UFH operates at lower temperatures than conventional forms of heating and is still able to heat areas comfortably. It achieves this by heating a much larger surface area which in turn provides the capability to create an overall much more efficient heating system, this enables savings to be made on running costs and eliminates dependency on the diminishing reserves of fossil fuels. Osma UFH has a fundamental understanding of UFH. Using this knowledge it has pioneered technological advancements within the industry, engineering new products and gaining the specialist experience required to produce an efficient heating within a multitude of floor constructions. By comparison with radiator heating UFH can reduce energy requirements while maintaining the same comfort level. Its compatibility with low temperature water allows full advantage to be made of modern condensing boilers, and makes the use of heat pumps more beneficial. Osma UFH systems for solid floor constructions include systems for all floor constructions that have the underfloor heating pipework embedded in either concrete or screed. Traditional sand and cement screeded floors. Floors formed using flowing screeds. 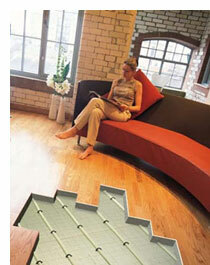 OSMA Underfloor Heating has solutions for all combinations of these constructions and others. The design and installation of the concrete or screeded floor incorporating underfloor heating must conform to the appropriate British Standards and Codes of Practice, including BS EN 1264-4:2001 floor heating, systems & components. Installation BS EN 8204-1:2002 & BS EN 8204-7: 2003 bases and in-situ floorings. In all forms of solid floor construction the overriding design requirements must be based on the structural requirements of the floor. Uniquely, OSMA Underfloor Heating has products that greatly assist with the design of the floor structure. Underfloor Heating can be used successfully with almost all forms of timber floor but achieving success requires specialist knowledge. It is very easy to install the wrong sort of UFH system, which can very quickly damage an expensive hardwood floor. By comparison, installing the right form of UFH can be the very best way of looking after a timber floor throughout its life. Osma Underfloor Heating has this knowledge plus long experience and it is the only company approved by English Heritage to provide UFH systems for Grade 1 Listed timber floors. Over the range of temperature change in a building between heating ON and heating OFF, timber does not change dimension to any significant extent. However, it does expand and contract as its moisture-content changes, which will happen naturally as the seasons change. Wood floors should be laid at a moisture-content of 10-11%. When the heating system is turned ON or OFF, and the moisture-content of the floor changes, it is very important to ensure that the moisture-contents of the upper and lower surfaces of the timber remain the same. If one surface becomes drier than the other, the timber will either cup or crown. Osma Underfloor Heating products are designed to conduct heat directly into the floor deck, rather than heat the air below the floor deck. Heating the air creates a heating system that provides much lower output than an Osma system provides but it can also over-dry the underside of the timber floor. Osma products have also been designed to work within the floor construction holistically. They allow the floor deck to be glued to the tops of joists/battens so that the strength of the floor construction can be maximised while at the same time they minimise the risk of creating floors that squeak or tick. Osma is able to supply UFH systems that fit completely within all of the Part E Robust Standard Detail approved timber floor constructions. Also products that are manufactured from Polyfoam extruded polystyrene are available in different thicknesses, to suit different floor U value requirements. Osma Underfloor Heating has developed a range of products that can be easily installed into timber constructions, including acoustic separating floors, which provide the user with the assured performance necessary for dry timber constructions.